Notes: Fawley station was built in a cutting at the end of a short approach road running from the end of Marsh Lane. The station had a single platform 350ft long by 12ft wide on the up side of the line. The platform facing was reinforced concrete with an ash fill and finished with a tarmac surface. The line ended at stop blocks just past the southern ramp. A loop for locomotives to run round their carriages was provided when the line was built and this was later extended at the north end for use by wagons and tank cars running into or out of the Anglo Gulf West Indies Petroleum Corporation Limited (AGWI) refinery. The line into the refinery ran for 50yd including a loop. The plain utilitarian single-storey station building was similar to that at Marchwood. It was constructed using 6in Frewin hollow building blocks, similar to those used widely on the Continent; the outside walls were rendered and finished with pebble dash. It had a red Marseilles tiled pitched roof with a central gable. The building comprised the ticket office, parcels office, goods store, booking hall and waiting room, men's and ladies’ toilets, a porters’ room, coal store, lamp room (at the north end of the building) and a gate box. Radiators were supplied from a Sentry boiler in the parcels office. The station was lit by oil lamps. The station was fitted with Southern Railway target nameplates and concrete running-in boards were provided at each end of the platform. This signage remained in use until closure of the station. Goods facilities comprised two sidings on the up side of the line at the north end of the station with facing points giving access from the main line. The two sidings diverged with that to the west terminating at a cattle dock with a movable pen. Access to the sidings was controlled by a signal box built into the northern platform ramp. 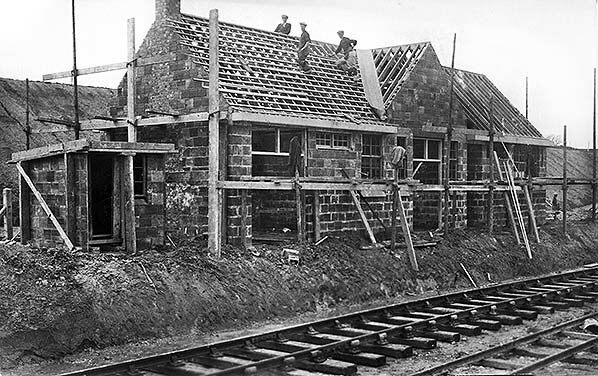 In 1927 the east siding was slewed to accommodate a small goods shed transferred from Tisted station on the Meon Valley line. A 1 ton 17 cwt crane was provided between the two sidings. The Railway Clearing House Handbook of Stations for 1956 shows that the station no longer handled livestock. At that date private sidings are listed serving the Air Ministry Depot No.2 and Esso Petroleum Co Ltd (Esso Sidings and Cadland Sidings). 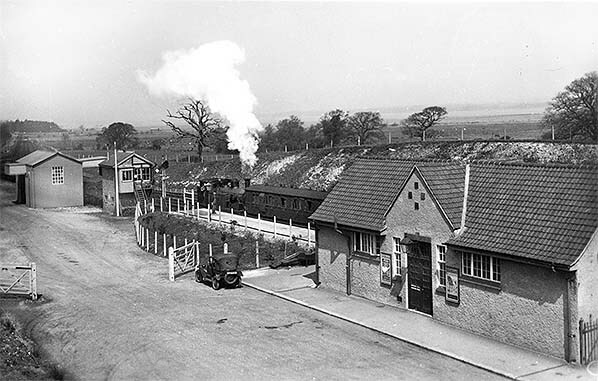 During the war the shunting neck for the yard was extended and provided with a turnout leading to a group of four new sidings to serve No.2 depot, the underground wartime petrol storage installation built for the Air Ministry. Therefore, at Fawley there were four parallel lines, from west to east, the shunting spur, the main line, the run-round loop/reception road and the goods loop. Fawley station closed to passenger traffic from 14 February 1966 and to goods traffic from 2 January 1967. After closure, the branch terminus saw numerous trains in the form of railtours. The last of these was the British Young Travellers’ Society 'Fawley Flyer' on 23 April 1978. This consisted of two shuttles running between Totton and Fawley, scheduled times were 10.45-11.45 and 12.10-13.19. Fawley signal box closed on 9 July 1978 to be replaced by a ground frame hut just inside the entrance gate to the refinery. At this time boundary changes brought the station and the approach road into the refinery with no further public access to the station. Railtours continued to run to Fawley but only as far as the refinery gate. On 16 June 2009 the Association of Train Operating Companies announced that it was looking into the reopening of the railway (now known as the Waterside Line) to passengers as far as Hythe, with a possibility of a further extension to Fawley if agreement could be reached with Esso. The proposals included reopening all former stations along the line with a new station in Totton called Totton West, sited just west of the junction with the main line. A new train service was proposed from Fawley or Hythe to Totton and onward via Southampton Central, Southampton Airport Parkway, Eastleigh, Chandlers Ford and Romsey before returning to Southampton Central, Totton and Fawley or Hythe, also serving other intermediate stations. Owing to security reasons at the oil refinery, it was decided that Fawley station would not be reopened as part of the scheme. In January 2014, Hampshire County Council shelved the plans owing to the business case 'offering poor value for money'. The scheme could, however, be revisited in the future if local circumstances change. Fawley station under construction and with, as yet, no sign of work commencing on the platform. This view is undated but probably from 1924 or very early 1925. A good idea of the method of construction is given and the building was finished off with rendering. In the foreground the standard gauge track has been literally laid directly onto the earth with no hint of ballasting at this stage. This track would have been used for incoming materials. Next to it is a narrow gauge contractors’ track, probably of 1ft 11½in gauge. This would have been used to transport materials around the site. The track appears quite feeble, even by contractors’ standards, and there may or may not have been a locomotive. If there was it was probably one of the small ex-WW1 Simplex machines which could once be seen almost everywhere narrow gauge track existed. 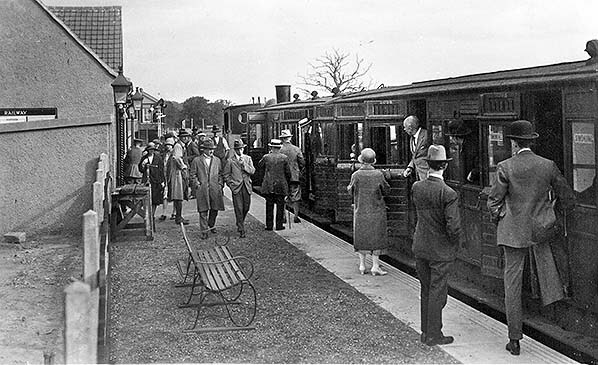 The opening day first train at Fawley, 20 July 1925 preparing to depart back along the branch to Totton. 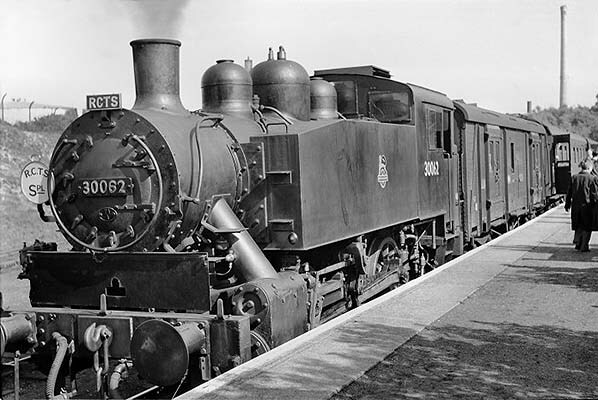 The locomotive is an Adams Class O2 0-4-4T and from the final batch of ten built in 1893, recognisable as such by its higher cab roof and stovepipe chimney. The 'stovepipe' chimney tapered wider towards the top and had only a basic rim. It was quite distinctive and once very common, with many so-fitted locomotives surviving well into the BR era. The LSWR coaching stock is of interest. 'SMOKING' can be seen etched into two of the windows and the carriage number can just be seen applied to the tops of the doors and is either 3096 or 3098, the last digit being unclear. This was normal practice and often also accompanied by another code which indicated to which compartment a door was fitted. Numbers, of the carriage concerned, were also commonly stamped onto various fittings such as door handles and this practice has proved invaluable in more recent times when attempting to identify grounded and dilapidated bodies or the origins of individual components. The clothing of the various people is also of interest and typical of the period following the discarding of Edwardian styles. Much of the clothing seen here would not have looked out of place in 1930s Chicago. On the station building can be seen some casement lamps. Perhaps surprisingly given the date and Fawley's proximity to Southampton, the lamps are oil-lit. The lamps seen here were eventually replaced by rather bland but functional electric lights although some had attractive octagonal reflectors. Much concrete is in evidence and the platform edging, with its anti-slip channels, is of a type very familiar today. The remainder of the platform appears, however, to be clinker-surfaced. 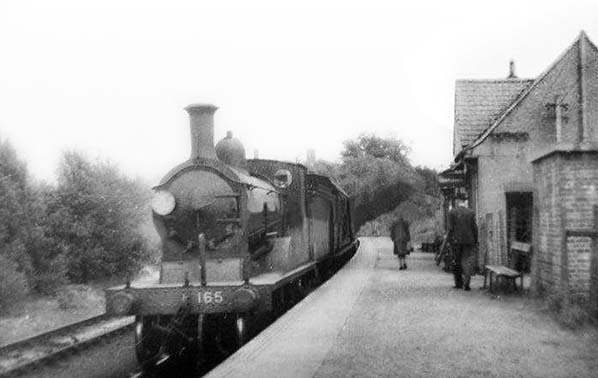 Nothing is known about this photograph which appears to date from soon after opening in 1925, if not on the opening day itself but this is not the same train as seen in the confirmed opening day view. The locomotive is, however, of the same type; an Adams O2 tank with stovepipe chimney. 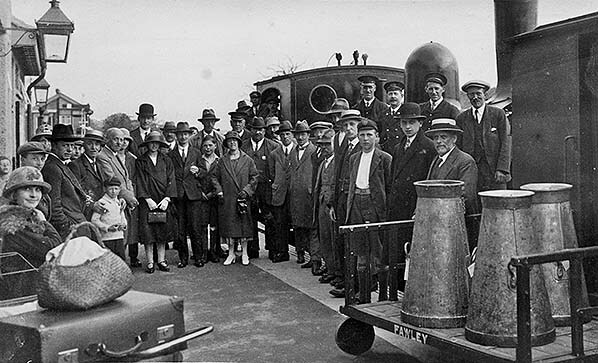 Various people can be seen: locomotive crew, station staff standing on the locomotive's running plate of which the gentleman on the left is the stationmaster, members of the public from a broad spectrum of classes and occupations. A number of young boys are present among the group and it is sad to think that within a decade and a half they would be called-up for active service during WWII and some may never have returned home. The trolley has probably been deliberately placed to ensure that the station name is visible and it was standard practice to paint station names on any such moveable item. The milk churns were a galvanised seventeen-gallon type which began to be replaced in the 1930s by the more familiar type with mushroom-shaped lids. Milk would be taken to the nearest station either by the farmer or collected by the railway company, more usually the former. Problems with cross-contamination were common and churns were gradually replaced, insofar as the railways were concerned, by tank wagons. Precisely when milk churns finally ceased to be transported by rail has been a subject of much debate but seems to have been during the 1960s. Whenever it was, it is yet another aspect of railway history which is today largely forgotten although churns are a common sight placed on heritage railway platforms for visual effect. Believed to be sometime in 1925, an Adams Class O2 0-4-4T arrives at Fawley with the fireman handing the pouch containing the single line token to the signalman. On departure the same pouch would be handed back to the crew, possession by the signalmen being necessary in order to reset points and signals and send 'line clear' to Marchwood. The locomotive appears to be No.235, one of the 'stovepipe' batch. Assuming the number to be correct, No.235 had been renumbered to E235 by this date although it was common for such prefixes not to appear on locomotives for quite some time. No.235 was to be spared the tribulations of WWII and nationalisation, being withdrawn in 1933. The poster wholly visible on the left is advertising summer excursions and towards the bottom is what appears to be a list of stations but individual names are unreadable. At far right can be seen part of the spur leading to the refinery. This is not visible in other circa 1925 views so the date given for this view, albeit approximate, should be treated with caution. It is, of course, possible that the spur was laid to facilitate delivery of materials to the expanded refinery which opened in or around 1931. The refinery in its original form dated from 1921 and thus, it should be remembered, predated the railway. 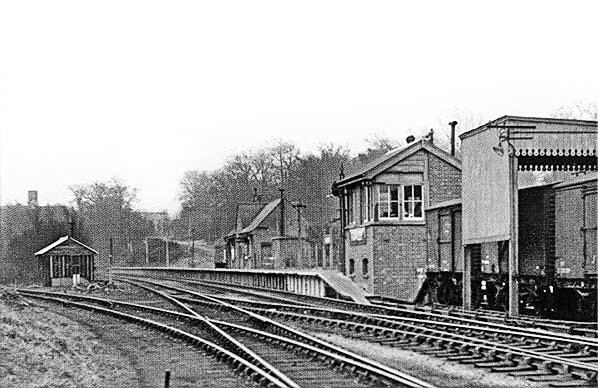 Fawley station viewed from over the forecourt soon after opening in 1925. A train is departing towards Totton behind what appears to be a Class O2 0-4-4T. On the left is the small goods shed, apparently and unsurprisingly constructed largely with concrete. On the forecourt sits an unidentified but typical motor car of the period. When viewed from the forecourt, the station building resembled a public lavatory but any confusion was, one would hope, dispelled by the Southern Railway posters. 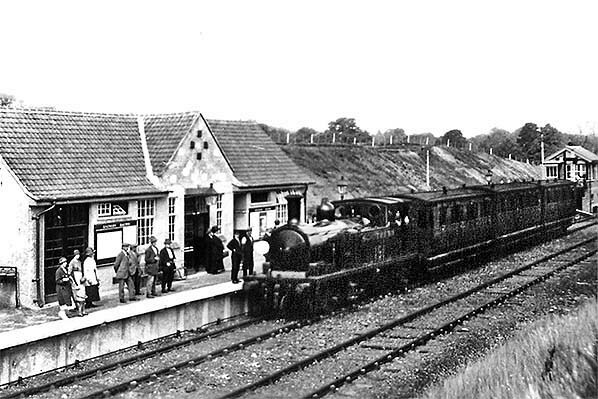 Fawley station, believed photographed soon after opening in 1925, with a train arriving behind a Class O2 0-4-4T. A reasonably large contingent of intending passengers is waiting. Some difficulty has been experienced in identifying the locomotive number. She is No.181 and in 1926 was renumbered to E181, this being the duplicate list and with the E signifying overhaul was the responsibility of Eastleigh Works. This locomotive was destined to be transferred to the Isle of Wight in 1949, where she became No.W35 'Freshwater'. Withdrawal came in October 1966 by which time the 'W' prefix had been dropped as she was simply No.35 but retaining her name. Image quality precludes identification of the train, other than that it is a 3-car set of 4- or, in one case, perhaps 6-wheelers. Several carriages of this type, but not necessarily ex LSWR, were also sent to the Isle of Wight where the Isle of Wight Steam Railway has recovered, and in some cases restored, examples which had been pensioned off as grounded bodies. 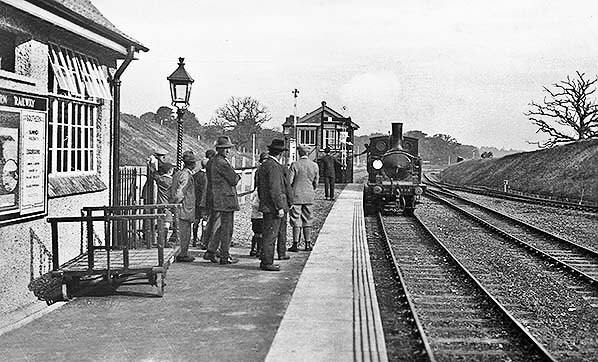 With the camera having exaggerated the platform curvature, this is Fawley station in the 1925-31 period when its surroundings were still deceptively rural. The refinery appeared in 1921 but was then a quite small affair. It greatly expanded in 1931, thereafter dominating the scene around the railway station. The locomotive is Drummond L11 class 4-4-0 No.165. Class L11 gained the nickname 'Large Hoppers', with Class K10 being 'Small Hoppers'. These nicknames were nothing to do with tender capacity or the brewing industry but arose from the rather feeble performance of the K10 which saw them restricted to short journeys, in other words 'small hops'. Class L11 was rather more capable and thus suitable for 'larger hops'. The headcode disc shape and position indicated Fawley - Southampton or Eastleigh. Upon nationalisation No.165 was allocated BR No.30165 but she was withdrawn in April 1951 without, it is believed, ever carrying her new number. A general view of Fawley station on 23 December 1950 with the refinery spur curving away to the left. This is one of the few views showing vans at the goods shed although the shed itself is out of view to the right with only its canopy visible here. There appears to have been a short extension to the platform, probably for the benefit of locomotive crews, as although early photographs are by no means clear they suggest the platform ramp originally ended before the signal box. The Fawley end of the RCTS special of 17 May 1953, showing 0-6-2T No.30757 which had hauled the train in. USA No.30062 was on the other end. The locomotive, No.30757, is of particular interest. 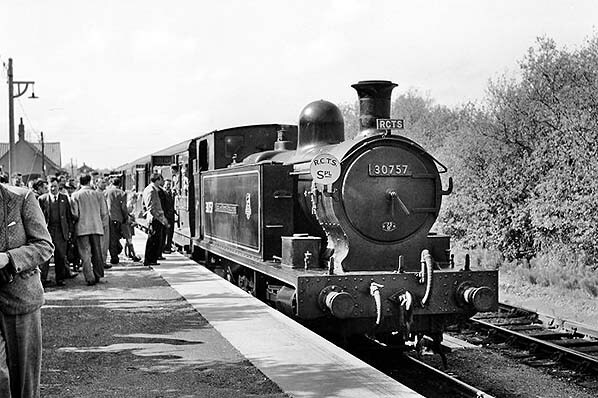 She was one of only two locomotives comprising the 757 class and originated with the Plymouth, Devonport & South Western Junction Railway (PDSWJ), essentially the line which is perhaps better known as the Callington branch and which still operates today as far as Gunnislake. What was to become BR No.30757 was named ‘Earl of Mount Edgcumbe’, a name also carried by a GWR Castle class locomotive, No.5043, which has survived into preservation, while what was to become BR. 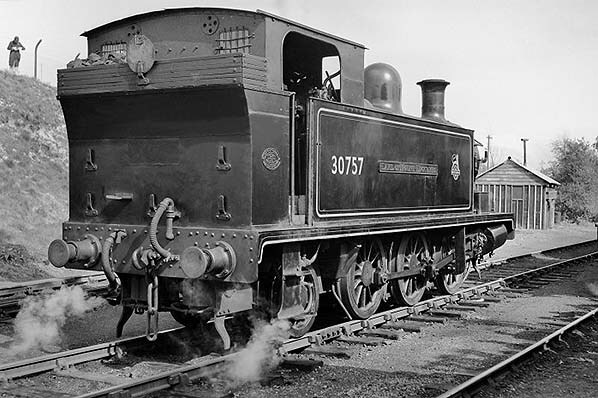 No.30758 was named Lord St Levan. They had been PDSWJ Nos.5 and 4 respectively. Built in 1907 by R & W Hawthorn, Leslie & Co, Ltd (Hawthorn Leslie) at the behest of Colonel H F Stephens, they were thus a rare, but not the only, example of former Colonel Stephens locomotives ending up with a main line railway company; usually it was the opposite way around. The 757 class, as the pair came to be known, were also a rare example of named tank locomotives surviving well into BR ownership with the exception of those on the Isle of Wight and certain Welsh narrow gauge locomotives. At Fawley No.30757 shows off her lined black livery with BR 'Cycling Lion' logo. Position of number and logo was to an extent dictated by the position of the nameplate and the result was a rather odd appearance. Nos.30757/8 survived until December 1957 and December 1956 respectively, with neither surviving into preservation. A brief history of the PDSWJ can be read here. Hawthorn Leslie, frequently misspelled as 'Hawthorne Leslie', gave up locomotive building in 1937 to concentrate on their shipbuilding work. Their locomotive interests were sold to Robert Stephenson & Co which then reformed as Robert Stephenson & Hawthorns Ltd, a firm better known in later years by its initials 'RSH'. A further and rather pleasing view of 757 class No.30757 ‘Earl of Mount Edgcumbe’ at Fawley on 17 May 1953. Presumably the RCTS special has departed behind USA No.30062, allowing No.30757 to be released. Features of note are the Southern arrangement of disc/lamp irons and the small bunker - hopelessly small, some may say. Some tank locomotives had what appeared to be enormous side tanks, as seen here, but actually contained additional coal space as well as water tanks but it is not known if this arrangement applied to the 757 class. The pipes on the buffer beam tell us that she is fitted with train braking and heating capability so, and as happened at Fawley, can work passenger trains. She is, however, fitted with an RCH coupling as opposed to the screw type. The rather awkward positioning of number and BR logo can also be seen. When initially given BR livery the logo was absent but it is unclear whether the 1948 interim BRITISH RAILWAYS lettering was applied.